Prime season for Brussels sprouts is late fall and early winter, especially after the first frost. They need the cold weather to develop their delicately sweet, nutty flavor. Smaller sprouts will have a sweeter flavor. Look for sprouts void of blemishes, yellowing or wilted leaves with tight, compact heads. Brussels Sprouts taste best when cooked quickly, until just tender. Overcooking causes a natural, unpleasant sulfuric taste and odor. To prepare the sprouts, trim off the thick outer leaves and remaining stem. Their leaves may be separated by cutting out the core with a small pairing knife and gently separating the leaves for a quick wilting in butter or olive oil. They may also be sliced thin and quickly sautéed. Sprouts were believed to have been cultivated in Italy during Roman times, and possibly as early as the 1200s in Belgium. The modern Brussels sprout that we are familiar with was first cultivated in large quantities in Belgium (hence the name "Brussels" sprouts) as early as 1587. 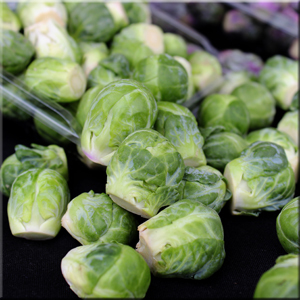 Brussels sprouts were introduced into the U.S. in the 1800s. They were grown in California in the early 1900s, with the first central coast plantings in the 1920s. With the development of the frozen food industry in the 1940s, Brussels sprouts production in California increased to its highest levels over the next 20 years. As production techniques have improved, and as foreign imports have increased, there are currently less than 3,000 acres of the tiny cabbages currently being produced in California. This acreage supplies the majority of the U.S. production from June through January, with nearly all of the acreage located in the central coast region (San Mateo, Santa Cruz, and Monterey counties).